75th Ranger Regiment, Ft Benning, Georgia. 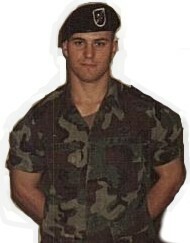 Killed-in-action in a street battle of October 3-4, 1993, which took place in Mogadishu, Somalia. The elder Joyce said his 24-year-old son was a good friend who valued relationships. "He put a lot of stock in friendship because we were more than father and son," said Joyce, who lives in Chicago. "He selected his friends carefully and put a lot of stock in commitment. He and his best friend would always help each other when needed." The escalation of humanitarian mission to Somalia last week has resulted in strengthing of US forces there and establishment of a time limit on direct US involvement. During an October 3, 1993 raid by Army Rangers on forces of warlord Gen Mohamed Aideed, held responsible for the June 5 ambush slayings of 24 Pakistani soldiers, 3 Blackhawk helicopters were downed, 18 US soldiers were killed, 80 were injured and 1 captured. The US captive, CWO Michael Durant, was released by Aideed Thu along with a Nigerian UN soldier who had been held since September 5. Armored personnel carriers and tanks were arriving in Mogadishu within days of the attack, and President Clinton announced steps to send additional troops, complete the mission and withdraw by March 31, 1994. An administration report to Congress Wed said another 3,000 ground troops would deploy, backed up by 3,600 Marines stationed offshore. There has been a call from some members of Congress for departing the region on an earlier timetable. In Somalia, there were mortar attacks on US forces at Mogadishu airport October 6, but both sides have since taken a less aggressive stance. US Ambassador Robert B. Oakley has returned to Somalia as special envoy. August 15, 1969-October 3, 1993. Buried in Arlington National Cemetery (Section 60, Grave 5791) next to Master Sergeant Timothy L. Martin, US Army Special Forces Command, Fort Bragg, North Carolina, who was killed at the same location and on the same date. "On Oct 3, 1993 my son (Sgt James C. Joyce) and 17 other brave young soldiers were killed in a raid that was not only sanctioned by the Clinton administration, but was also necessary to fulfill a misguided American policy to capture Somali warlord Farah Aideed. "Two months later to the day, US soldiers were escorting Aideed to the Mogadishu airport by motorcade and flying him to Addis Ababa in a US Army airplane. This contradiction is but one more revelation that puts a spotlight on the amateurs developing foreign policy. Foreign policy blunders are always embarrassing, but when American troops are sent into combat to enforce an ill-conceived, politically motivated order, the results are tragic with consequences that shock the nation. They devastate families, and send presidents, politicians and bureaucrats running for cover. "If capturing Aideed was so important August 23, when the Ranger task force was sent to Mogadishu, why was it so unimportant the day after 18 soldiers were killed and 18 families were left grieving? Now, the same amateurs who orchestrated that fiasco are dishonoring every American soldier who died in Somalia and are insulting every family who lost a loved one there. Every soldier who puts his life on the line or lost a comrade in Somalia must feel violated, too. President Clinton, in an October interview, dismissed those who were killed fighting for his ill-advised policy as "unfortunate losses." On December 6, when asked what he would say to the 18 families about the VIP treatment given to Aideed, the President said he would tell the families that their soldier sons and husbands were over there fighting for peace, and "achieved their objective." Well, Mr. President, when you lose money in the stock market, that's an unfortunate loss. When you cause 18 bright, dedicated and loving young Americans to die trying to implement your frivolous directive, that's a tragedy that demands you take corrective action before you put one more American life on the line. "And, so far as American national interests are concerned, the entire country of Somalia is not worth one American soldier's life. So, this family, for one, doesn't buy your assessment of success. It sounds a lot more like damage control to us. Mr. President, please use Somalia as the catalyst to put the foreign policy and defense sides of your administration in order. Hold those accountable who let down you and the nation. Their arrogance and incompetence cannot be tolerated one more day." "For me, October 3 is a day of irony that will forever be burned in my memory. On that day in 1906 my father was born in dusty Segoville, Texas. And, on the same day in 1993, my son was killed on a dusty street in Mogadishu, Somalia. On this October 3, I'll call my dad and wish him well on his 88th birthday. And at a ceremony at Arlington National Cemetery, I'll observe the first anniversary of my family's most tragic loss. The ceremony was arranged by No Greater Love, a non-profit group formed to honor the memory of those who gave their loves in defense of this nation or through acts of terrorism. Today, they will remember the 44 members of the Armed Forces who died in Somalia during Operation Restore Hope. My family will be there, along with the families of the other American casualties of Somalia. "It will be the first time that most of us have met, even though we share an unenviable bond. While we haven't had a chance to discuss it yet, I'm sure we share something else too: the hope that this day will remind the nation of the terrible price we pay when our brave young men and women in uniform are sent to enforce an invalid foreign policy. As we dedicate the tree and stone monument in Arlington, I'll also be reflecting on another memorial two miles away -the one that carries the names of 58,191 of my old comrades. I always hoped that the terrible price my generation paid in Vietnam would not have to be paid by my children or my grandchildren. But that hope was dashed last October 3. Now I simply hope that the sacrifices of those 44 brave young men are not forgotten. That is why the ceremony is so important. Already the media's memory of Somalia is beginning to fade. Reporters and columnists continually refer to President Clinton's foreign policy misadventures but few mention Somalia. "Three days before American troops were sent to Haiti, The New York Times reported that the anticipated invasion would be the first time Clinton had ordered American soldiers into ground combat. What about Somalia? President Bush sent the first contingent of 25,000 troops to ensure starving Somalia were fed. By the Spring of 1993, all but 4,500 troops had been withdrawn and the mission was turned over to the United Nations. The responsibility of what happened to American troops in Somalia after that lies at the feet of the current White House resident. Our policy in Somalia changed dramatically when President Clinton let the UN Secretary General talk him into switching a UN humanitarian mission into a unilateral US manhunt. "I got the chance to ask President Clinton that question on May 12. The answer was, "I don't know." He told me he didn't want to micromanage the military and had intentionally remained disengaged from military matters in Somalia. Tragically, no one told the Rangers the rules had changed and to "back off" on capturing Aideed so a diplomatic solution could be put in place. And Robert Oakley, President Clinton's former special envoy to Somalia, is the only one close to the administration who has publicly acknowledged that there was a breakdown in communications between the White House and the military. He made that admission to "Dateline NBC" in July. I hope President Clinton and future commanders in chief learn this from the foreign relations debacle in Somalia: When American troops are in a combat environment, they become the number one priority. Domestic agendas should be pit on the back burner until the troops are out of the line of fire. The President must constantly stay abreast of the military situation to ensure that military actions are consistent with current foreign policy. "Had President Clinton taken these simple steps, there could have been at least 18 fewer young men for us to mourn in Arlington on October 3." 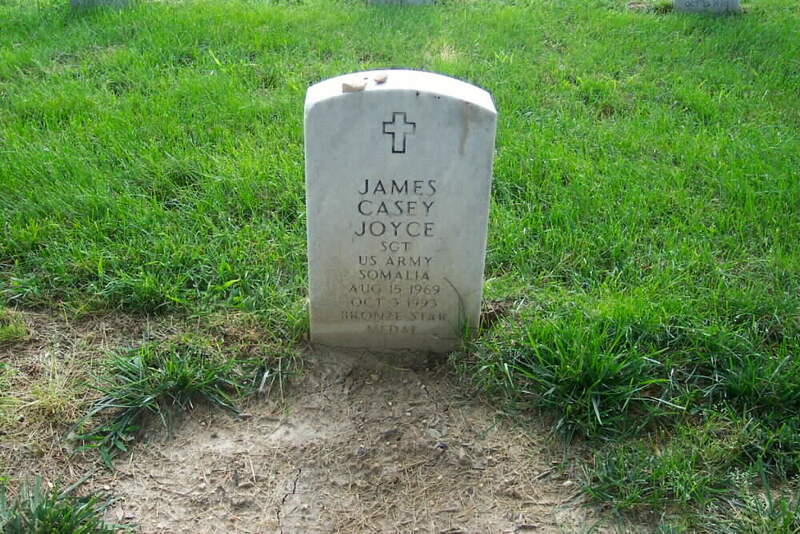 Colonel (Ret) Larry E. Joyce is the father of Sergeant James Casey Joyce, an Army Ranger who was killed in Mogadishu October 3, 1993. He served 2 tours in Vietnam. NOTE: Colonel Larry E. Joyce died in May 1999 and was buried with his son in Arlington national Cemetery.